MDC-T President Morgan Tsvangirai has warned Zanu-PF that there would be no national government of unity in 2018 because the liberation movement has squandered its opportunity to convince the people that it has the capacity to turn around the economy. He was speaking at a memorial service for the late Chief Josiah Rimbi, an active MDC-T member who was appointed a senator during the inclusive government. "We helped them in 2008. Some of us entered into GNU not because we wanted power but we wanted to help you the people of Zimbabwe. After they realised that the economy was improving they said they want to go it alone. They stole the election and six months down the line the economy is on its knees again. "This time around there will be no GNU. We want a free and fair election. We will not come to you. If Zanu-PF wins we will congratulate them and if MDC wins they should accept and know that change in imminent," said Tsvangirai to thunderous applause from his supporters. He said Zanu-PF was facing a number of challenges and its leadership was focusing on internal power battles. "We should take advantage of the chaos in Zanu-PF to bring about the change that we want," said Tsvangirai. "It`s sad that we have invested in our children through education so that they attain degrees - but we now spend time with them working in our garden. Why? There are no jobs. This means parents will die taking care of their children who are degree holders. "The problem in our country is not about economy but the politics brought about by Mugabe. This is politics of intimidation, grabbing farms, destroying the vibrant industry and killing the vote and future of the people of this country," said Tsvangirai. He added that people have been going to the ballot for years but Mugabe was clinging to power despite any outcome of the election. "That's why we are saying no reforms, no elections. We cannot go to vote being driven like cattle. Can we go to vote when Zimbabwe Broadcasting Corporation (ZBC) is only talking about Zanu-PF? Can we go to vote when we are not assured that our vote will make any change that we are looking forward to? Can we go to vote when Zimbabwe Electoral Commission (ZEC) cannot run an independent process so that people`s votes can be counted. We cannot go to such an election," said Tsvangirai. "We are ready to remove Zanu-PF through ballot not bullet. If we follow the democratic principles of our party, it means the ballot becomes our instrument for liberating ourselves," said Tsvangirai. He said since independence in 1980, Zanu-PF had allowed a few individuals to loot the country`s resources and enrich themselves at the expense of the majority. He urged his supporters to be patient, saying the right time for change is coming. 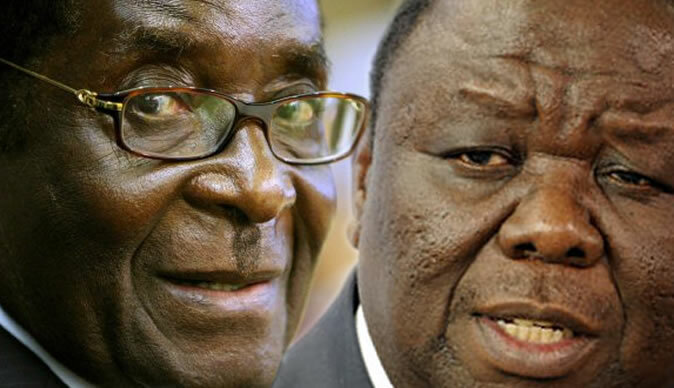 "Whether Mugabe and Zanu-PF like it or not change is imminent," said Tsvangirai. "They have done enough damage to the economy."